Would you travel to Seville to declare your love to your couple? Yes! That’s what Lucas thought and did. 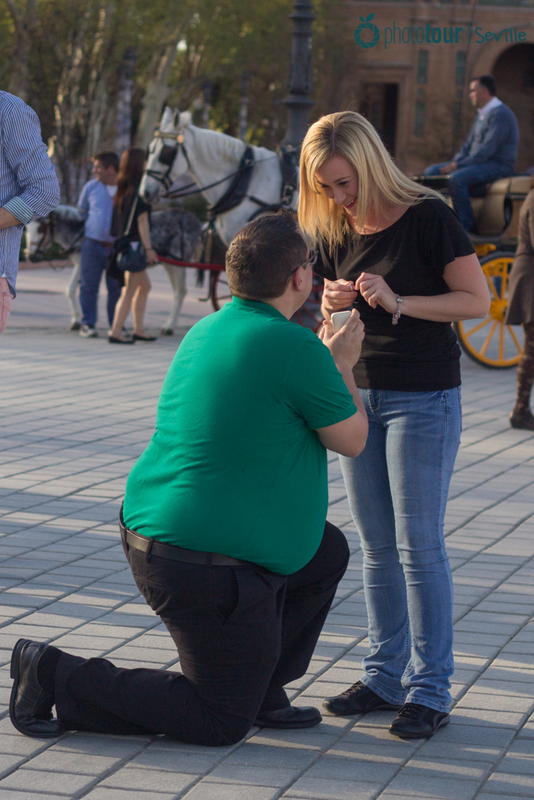 He chose this city because its beauty and romantic spots made Seville the perfect place for a marriage proposal. 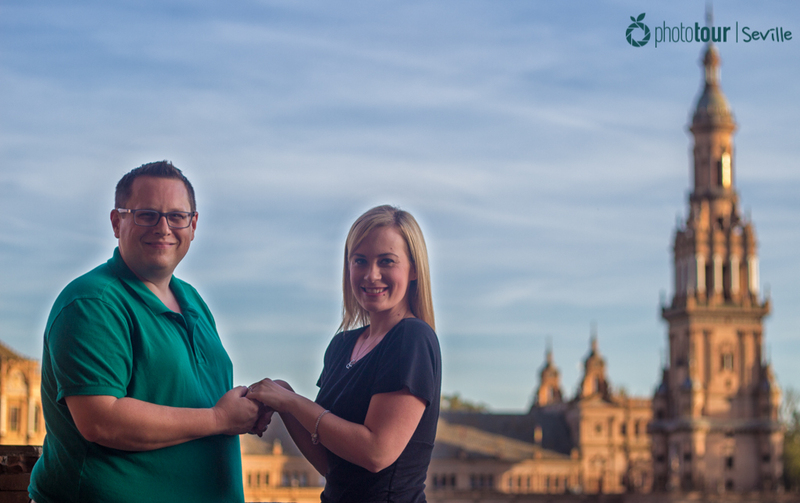 So Lucas contacted us at Seville Photo Tour asking us to cover his marriage proposal in the center of the emblematic Plaza de España. How could we miss such an important moment? We promptly confirm him our presence and book the day for them. So they came from Atlanta to Seville at the end of March, when spring starts at Seville. This is the perfect time to visit the city. 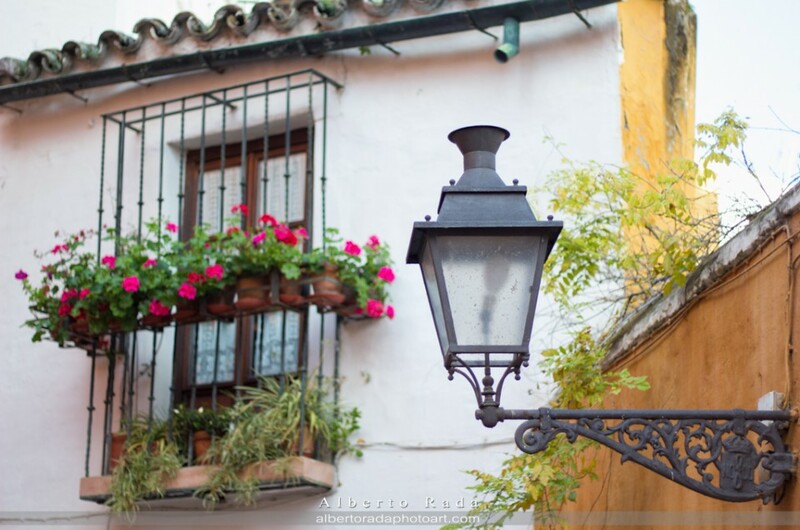 Sunny days, good weather, and orange trees starting to bloom its azahar flowers… This impregnates Seville with a magical smelling that make people fall in love easily. How could you miss the opportunity to get awesome pictures of your stay in Seville with our photo tours? There’s no better place to celebrate your marriage proposal than Seville during spring! So we met them at Plaza de España, one of the most beautiful places in Seville which mixes architecture elements of the Renaissance Revival and Moorish Revival styles, with a nice lake and the awesome Parque de María Luisa around it. But… at the beginning, Lucas did not want his girlfriend to know about our presence, so we were taking photos of them hidden from the distance… like paparazzies! As time went by, Lucas was getting more nervous because he knew something epic was about to happen. Once he was on his knees to do the marriage proposal, we approached them and cover the moment with detail. Lucas was a bit nervous, and Danielle was pretty surprised. And after a few seconds, the answer was… YES!! 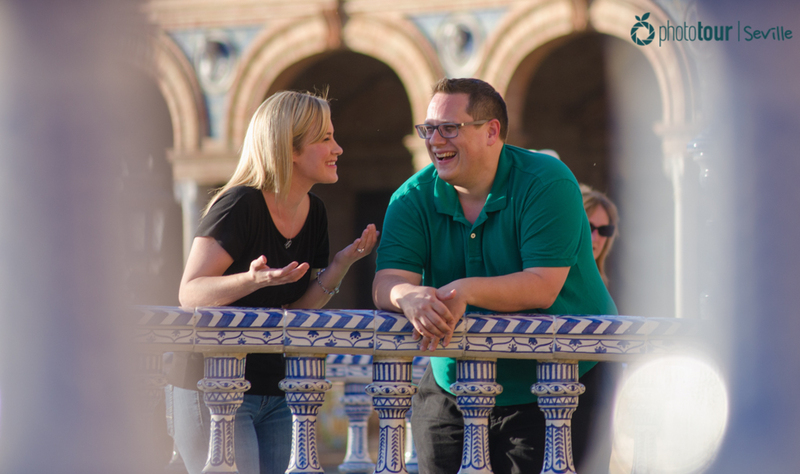 The happiness invaded the place and we celebrated the moment by taking the couple around Plaza de España and taking photos of them as brand new engages. We spent a lovely time with this beautiful couple and we wish them to have an amazing wedding in Atlanta. If you are looking to immortalize your marriage proposal, declaration of love, or just a special moment for you and your couple, drop us a line! In Seville Photo Tour we will arrange a beautiful surprise for you that will be saved forever. Do you know all we can offer to you with our photo tours in Seville? Take a look here!